The Shakespeare Folding stool with back pack features a lightweight folding stool with canvas seat and integral rucksack Adjustable and padded shoulder carry straps. Main compartment secured by drawstring plus quick release buckles Additional 3 pockets with clip fasteners. Lightweight folding stool with canvas seat and integral rucksack Adjustable and padded shoulder carry straps. 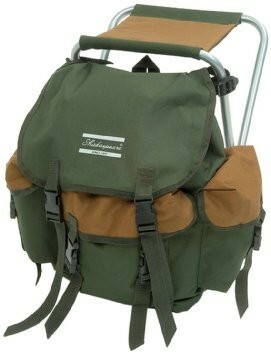 FREE Delivery on all Shakespeare Rucksacks / Carryalls over £100!! !